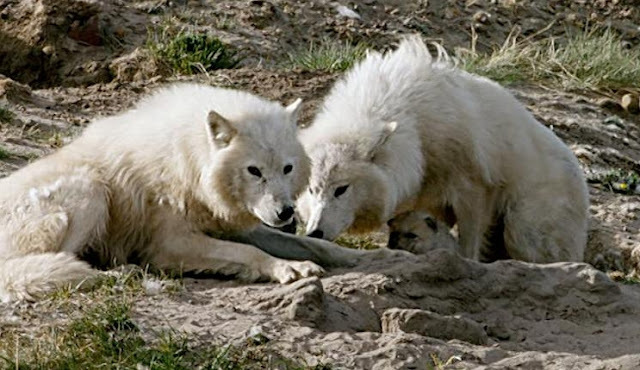 Snow White and Blackspot, two female arctic wolves, share a deep and meaningful bond. Blackspot cares for Snow White’s pups and even nurses them! Having two females nurse the same litter is exceedingly rare – it’s a behavior that’s never been filmed before. Wolf pups grow very quickly. By the time their eyes open, 15 days after birth, they weigh four pounds. At three weeks they begin to play inside the den. Two weeks later they weigh 13 pounds and have begun wandering outside the den under the watchful eye of their mom. This is when their mother starts to wean them from milk. She and the other adult pack members start the pups on solid food by regurgitating semi-digested meat directly into their mouths or by depositing this food on the ground in front of the pups. When the pups get big enough the adults bring pieces of meat from their kills for the pups to eat. Between the ages of two and three months the pups leave their den permanently. Soon after this they begin traveling and hunting with the pack. Responses to "Two female Arctic wolves nursing pups together"